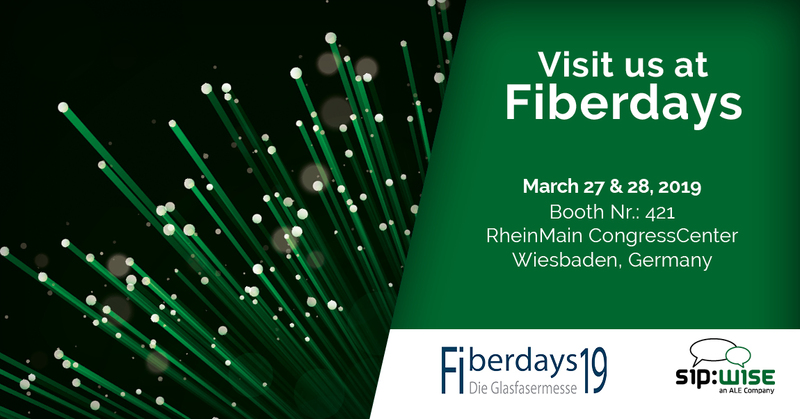 Fiberdays 2019 is Germany’s leading trade fair for fibre optics that will be held on March 27 and 28. Up to 3,000 trade visitors from Germany and abroad are expected to attend the 2-day event. Sipwise exhibits and presents its solutions around cloud-based communication tailored to the glass fibre industry. Sipwise showcases interested business partners how a powerful infrastructure and cloud-based products can help boost growth within the company. On Wednesday, 27th of March, our representative and IT specialist Christian Emerich will conduct a workshop on “Development of cloud-based communication”. The workshop is dedicated to the further development of business communication in the focus of a comprehensive digitisation and virtualisation. Due to the progress in the field of data transmission, which is driven not least by the expansion of the fibre optic infrastructure, services are increasingly being realised in a decentralised manner in large data centres. Here, Google and Amazon in particular are investing heavily in new business models. The workshop is intended to develop the needs and requirements of the industry for communication and new media in the light of these developments. Date: 27th March 2019, 2.30 p.m.
On the first evening of the fair will be a business get-together: The Networking Night. In a relaxed atmosphere, visitors can meet and exchange ideas at the exclusive event at the fair. Sipwise is sponsoring a round of “Sipwise Beer” exclusively for the visitors. Stop by, pick up a sip of beer and get in touch with us. This year Sipwise exclusively sponsors the congress bags of the Fiberdays 2019. Pick up your bag at the entrance and store all your brochures and trade fair information in one place. Sipwise will be at booth 421 at Wiesbaden in Germany. We are looking forward to welcoming you at our stand and get in touch with you.